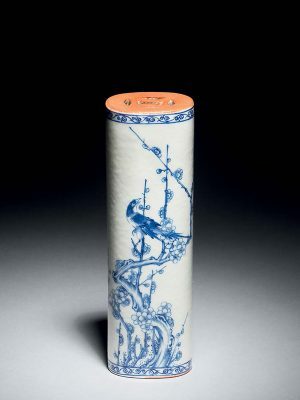 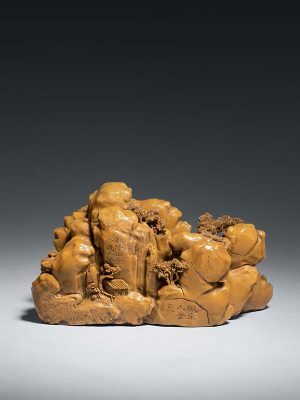 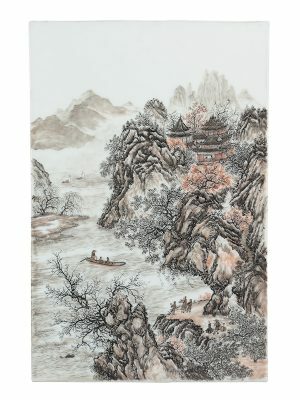 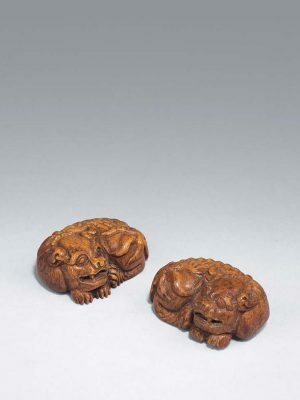 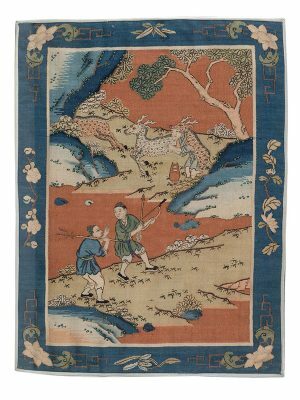 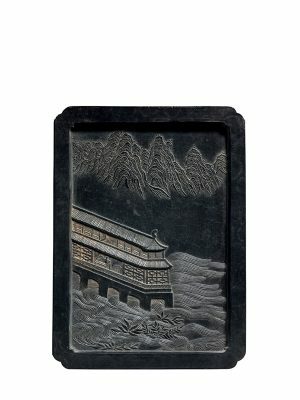 We are pleased to offer for sale a selection of Chinese works of art, whose subject is landscape. 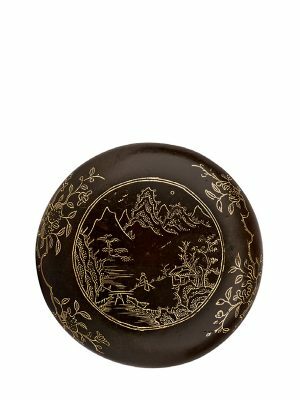 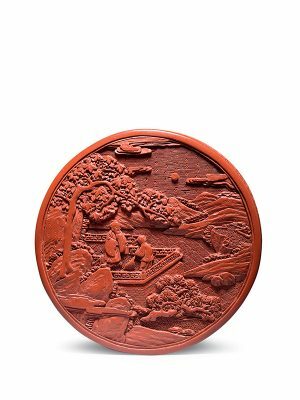 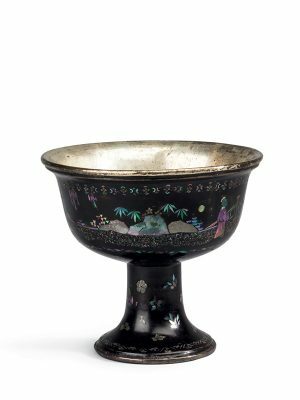 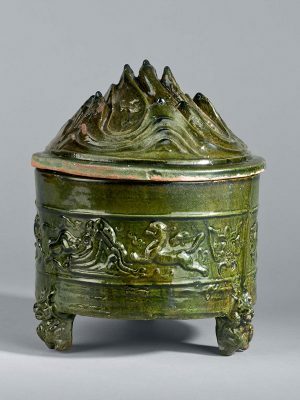 Landscape scenes play an important role in Chinese culture and are depicted on all manner of materials, such as pottery and porcelain, enamel, lacquer, jade and other hardstones, and wood. 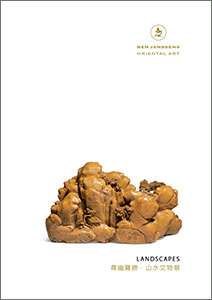 This catalogue includes a very fine yellow soapstone boulder carving (no. 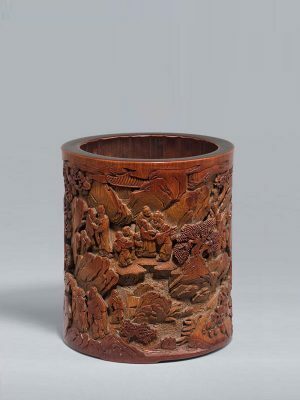 2), representing a landscape with figures walking about and gathering in groups. 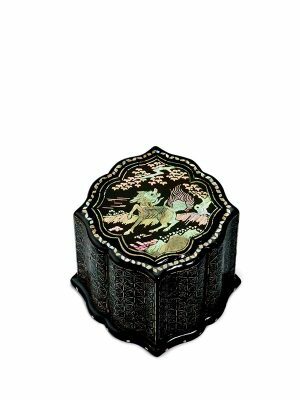 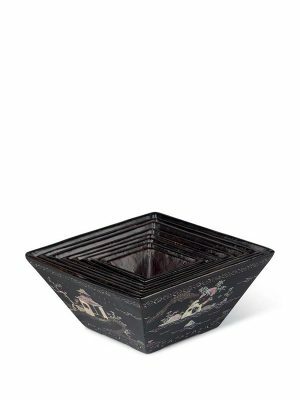 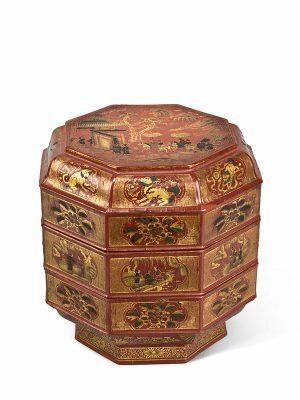 The selection of lacquer pieces is large and varied. 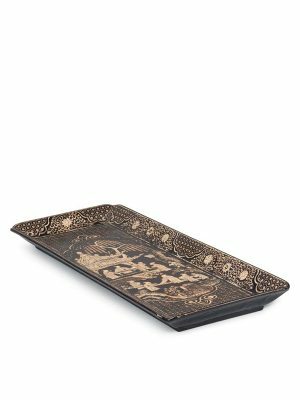 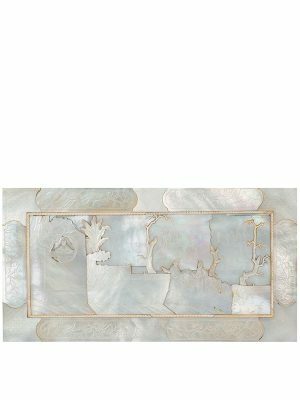 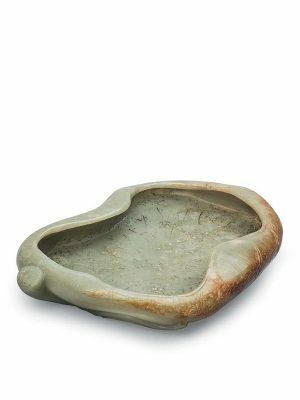 Featured are mother-of-pearl inlaid pieces such as a very fine tray for presenting scroll paintings (no. 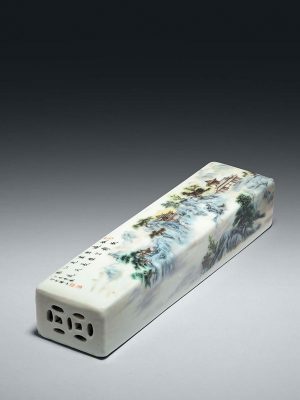 18), which is inlaid with minute pieces of mother-of-pearl and depicts groups of scholars examining a painting, whilst another figure plays a stringed instrument inside a pavilion. 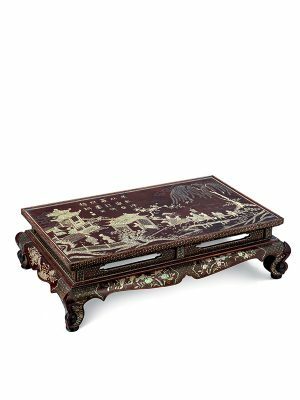 Also included is a kang table (no. 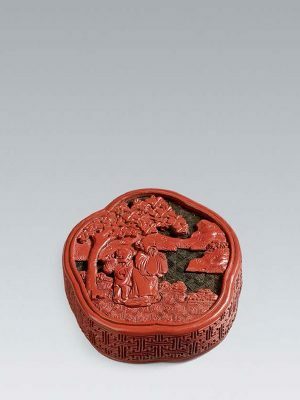 3), again inlaid with tiny pieces of mother-of-pearl, which depicts a scholar returning home triumphantly from his examinations.Among the carved red lacquers a portable cabinet (no. 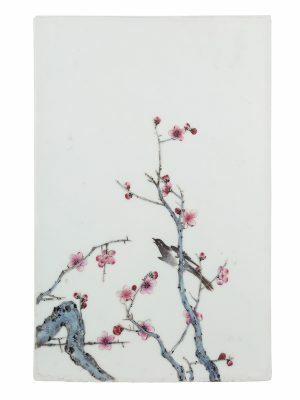 11) stands out. 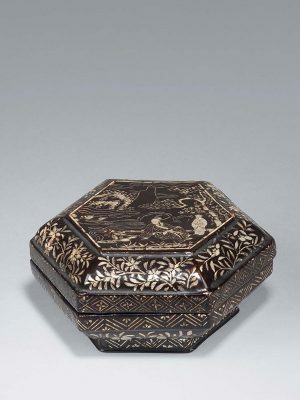 It is equipped with giltbronze carrying handles and a fitted interior. 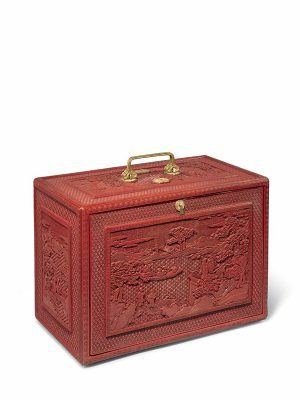 Portable cabinets with compartments for storing smaller items such as seals, paper and brushes were a practical necessity for the active scholar, enabling him to move a multitude of paraphernalia quickly and easily. 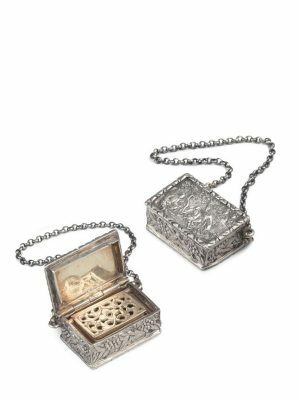 The category silver and jewellery contains some interesting items: a silver repoussé vinaigrette (no. 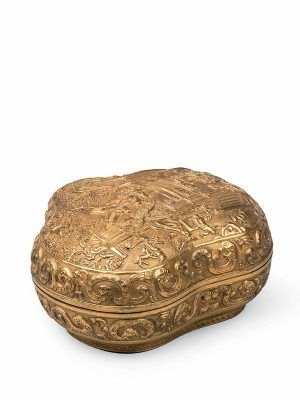 27) was used for carrying perfume and scents, providing a more accessible and practical alternative to moving large glass bottles. 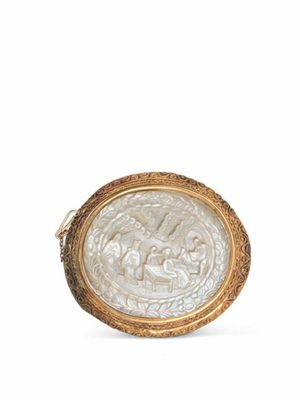 A mother-of-pearl and gold brooch (no. 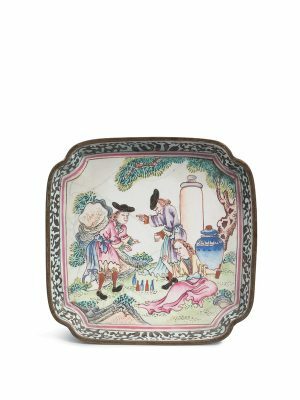 38) shows a landscape scene in which a lady holding a fan leans on a square table with several other figures standing around her. 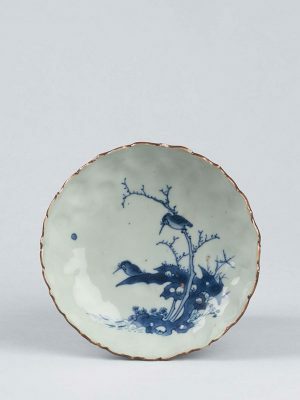 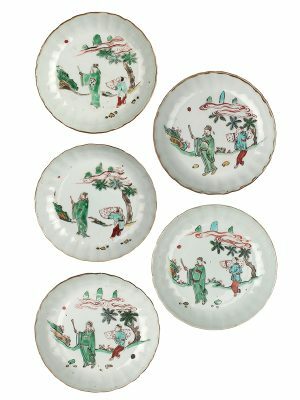 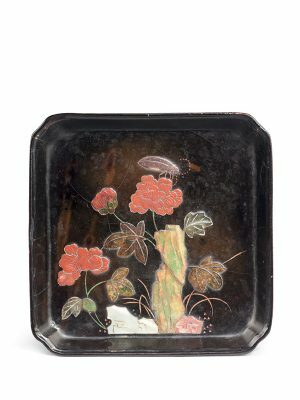 There are various interesting porcelain items in this exhibition, particularly a porcelain plaque dated to the mid-20th century, which is painted in delicate enamels with a landscape scene (no. 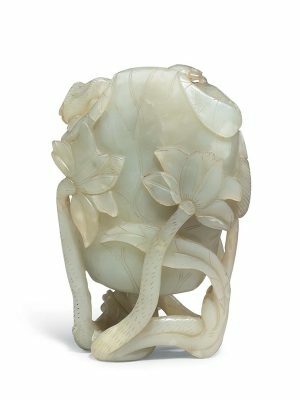 36). 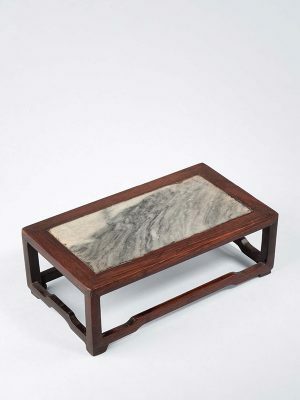 It was bought in Mexico. 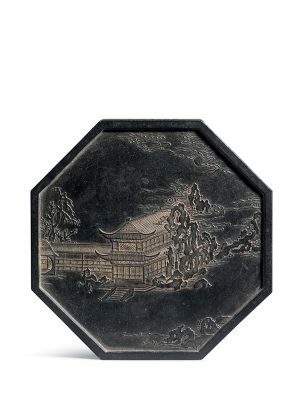 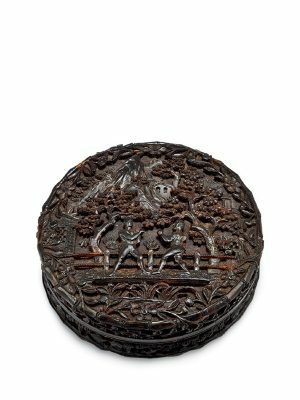 The works of many Chinese ceramic artists were featured in exhibitions in Central and South America during the 1950’s and 1960’s, so it seems likely that this plaque was bought at a local exhibition at that time and subsequently stayed in Central America. 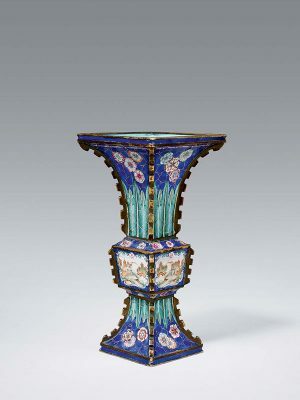 Our exhibition will take place during the event Asian Art in London. 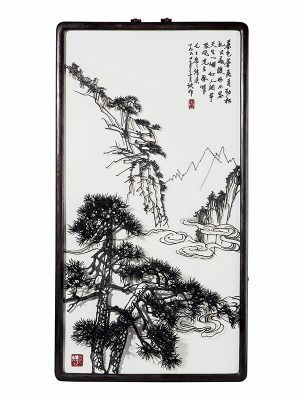 Exclusively during Asian Art in London we will again be exhibiting at M&L Fine Art in Old Bond Street, Mayfair. 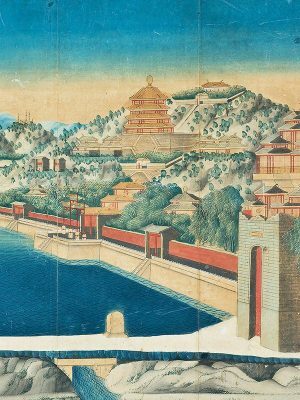 We hope you will enjoy this catalogue, and we very much look forward to welcoming you during our exhibition.